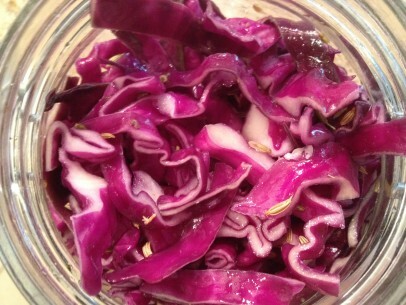 Red cabbage pickles up super quickly – no waiting a month or more before eating, just a week and you’re ready to enjoy. This traditional recipe is a great way to use stored winter red cabbage especially and this dish is a lovely as it is delicious. I love it on top of a plate of humus! 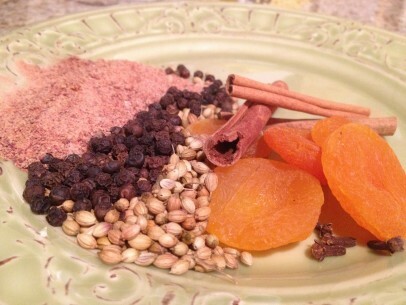 The pickling spices are key to this recipe with a perfect mix of flavors. It may seem an unlikely combination at first glance, but I promise you will not be disappointed. 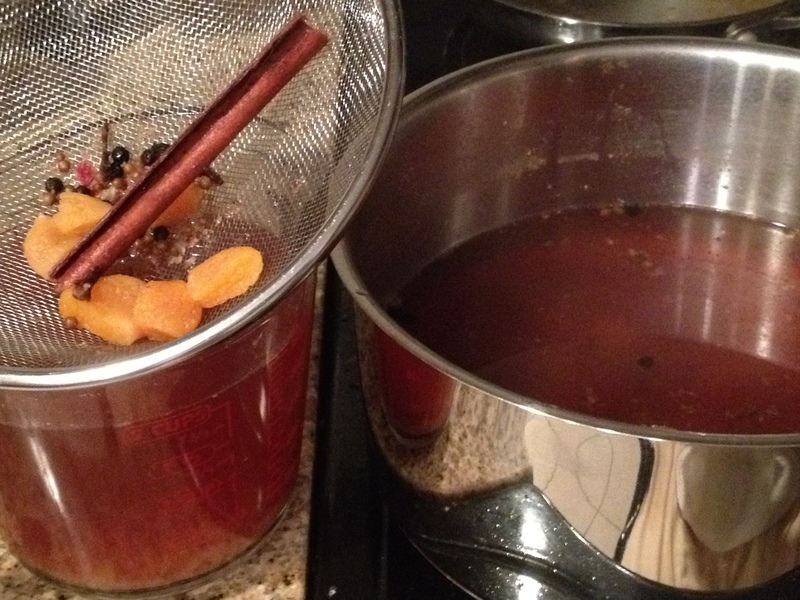 Simply add the brine ingredients together in a pot, bring to a boil and allow to cool. Remember to carefully strain off all of your pickling spices before adding to the cabbage filled jars. Even after straining, check once more for any errant cloves to avoid any emergency dental visits! The dried apricots and coriander seeds bring a bright citrussy tone that complement the heavier spices of cinnamon, cloves, coriander and fennel well – a delicate and lovely balance. I like to begin by making the brine. It has to cool a bit before you fill your cabbage jars so by getting it done first makes sense. 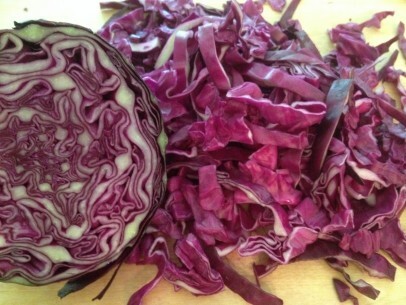 Once your brine is cooked and cooling, peel off any loose outer leaves from cabbage head, cut out core and slice red cabbage into thin strips. You may have to peel of a few outer leaves but don’t worry, there will be plenty of cabbage left for pickling if you start with a 2-2 1/2 pound head. The next step is important as it releases the bitterness of the cabbage before pickling so don’t be tempted to skip it. 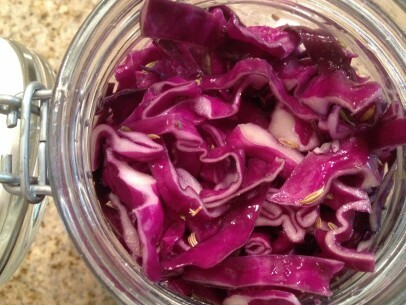 In a large bowl, add sliced cabbage and mix in salt until cabbage strips are well coated. Almost immediately, you’ll notice beads of moisture coming off the cabbage. Transfer salted cabbage to a strainer over the sink or a dish towel lined baking sheet. I prefer the dish towel method myself, just make sure you use an older towel that you won’t mind a few red stains on! Allow cabbage to ‘sweat’ for at least 30 minutes. Some cooks leave it overnight but I like to leave it out about an hour or so. While still on the cookie sheet or in the strainer, sprinkle fennel seeds over the top of sweating cabbage strips and transfer cabbage from baking sheet directly into cleaned jars. Important to remember – DO NOT RINSE off the salt or fennel seeds! Then simply pour cooled pickling liquid carefully over cabbage filled jars and you’re done! Seal jars tightly and allow to sit in a cool, dark place for 5-7 days before enjoying. Make sure to refrigerate jars once you open them and sealed jars can stay in cool, dark place for up to a year before opening. I think hinged canning jars are perfect for this recipe though you can also use Mason jars with the lids/bands if you prefer. My favorite hinged preserving jars are made by Le Parfait. They’re admittedly a bit pricey but they’re worth every penny and last forever. I’ve had a couple of mine for probably five years or so and the rubber rings are completely intact and not stretched or wiggly at all. You can also buy replacement rubber rings when the originals start to get loose. To clean your jars, fill with boiling water and allow hot water to cool in jars before pouring out. Turn empty, sterilized jars over onto a clean dishtowel to dry. Combine all brine ingredients in medium pot and bring to a boil. Simmer gently for 10 minutes. Allow to cool for about 15 minutes before adding to jars. Remove outer, loose leaves from head of cabbage and slice into thin strips. Add sliced cabbage to a large bowl and add salt. Stir well so all strips are salted. 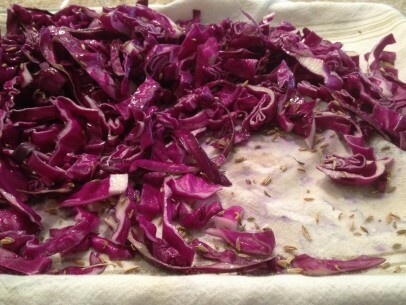 Spread thin strips of cabbage on a cookie sheet lined with clean dish towel and leave for at least 30 minutes to sweat. Sprinkle fennel seeds over the salted cabbage. Fill and pack down sweated cabbage into cleaned jars. DO NOT rinse off the salt/fennel seeds. Pour cooled brining liquid carefully over the cabbage filled jars, pack down the cabbage a second time and seal lids tightly. Set aside for 5-7 days in cool, dark place. Refrigerate after opening. Pickled red cabbage should keep refrigerated for up to a month and, unopened in cool, dark place for up to a year. Serve along side just about anything or enjoy all on its own with crusty bread. Drizzled a little good quality Greek olive oil over the top and you’ve got a meal fit for kings! This recipe is too salty…waaaaaaay waaaaay to salty. If you are going to put the salt on the cabbage like this recipe says to do…I WOULD NOT put any salt in the brine. If you do decide to put salt in the brine for some reason most definitely do not put 2 tbsp more like 2 teaspoons of salt. I followed this recipe exactly..and mine came out so salty it was inedible. After much work I managed to save the batch. I made a second batch without the salt in the brine and it came out perfect. I also added a little bit of apple to the first batch and my friends and family loves it. I hope this helps anyone who wants to try this recipe. Should you give the jars a hot bath once filled? I thought you always had to do that to seal the jars to properly store the food, even for pickled vegetables, is that not correct? Thanks! This sounds amazing! I’ve never used a hot bath with this recipe nor, to my knowledge, have my mom, aunts or grandmothers. To date – there have been no family fatalities reported 🙂 Of course, this information is not based on medical research, just my anecdotal experience – and this recipe really is amazing! So can’t wait to try this recipe!!! This sounds delish!! 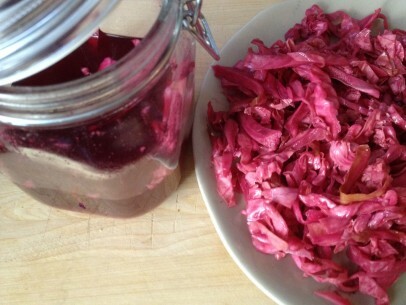 Back in the late 70’s my boyfriend’s mom from Cyprus made a spicy pickled cabbage. I have been looking for a recipe. Would crushed hot pepper flakes do it? Also I have never pickled anything before and I live in Florida, can I keep the jars in the fridge?